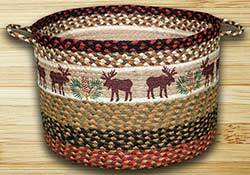 Our braided jute baskets have an endless variety of decorative and home storage uses - keep in your care for toys or trash, set near a fireplace for kindling, use in a bathroom for towels, place in a bedroom corner for laundry, store pet toys, the list goes on! 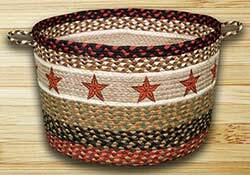 Burgundy Star Utility Basket, by Capitol Earth Rugs. Color palette is of mainly burgundy red, mustard, and tan, with stenciled starss. Sold individually from three sizes - Choose the Small, Medium, or Large. Sold individually from three sizes - Choose the Small, Medium, or Large. Small measures 9 x 7 inches; Medium measures 13 x 9 inches; Large measures 17 x 11 inches. 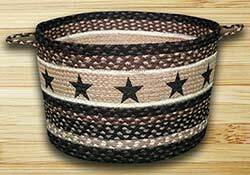 Crow & Star Utility Basket, by Capitol Earth Rugs. Color palette is of mainly black, red, and tan, with stenciled stars and crows. Designed by Susan Burd. Sold individually from three sizes - Choose the Small, Medium, or Large. 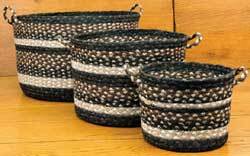 Sold individually from three sizes - Choose the Small, Medium, or Large. Small measures 9 x 7 inches; Medium measures 13 x 9 inches; Large measures 17 x 11 inches. 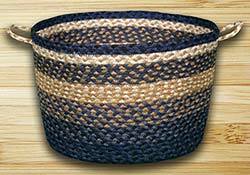 Honey, Vanilla, & Ginger Utility Basket, by Capitol Earth Rugs. Color palette is of warm, spice-like shades of tan, creme, and honey brown. Sold individually from four sizes - Choose the Mini, Small, Medium, or Large. Mini measures 8 x 6 inches; Small measures 9 x 7 inches; Medium measures 12 x 9 inches; Large measures 17 x 11 inches. 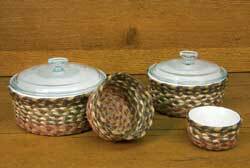 Honey, Vanilla, and Ginger Braided Jute Basket Set, by Capitol Earth Rugs. Designed to fit Corning Ware French White Round Casserole dishes. The set of four sizes includes 1 of each of the 7 ounce, 16 ounce, 1.5 quart, and 2.5 quart. Light Blue, Dark Blue, & Mustard Utility Basket, by Capitol Earth Rugs. Color palette is of shades of light and dark blue, creme, and mustard. Sold individually from four sizes - Choose the Mini, Small, Medium, or Large. Mini measures 8 x 6 inches; Small measures 9 x 7 inches; Medium measures 12 x 9 inches; Large measures 17 x 11 inches. Olive & Burgundy Utility Basket, by Capitol Earth Rugs. Color palette is of mainly burgundy,olive green, and grey. 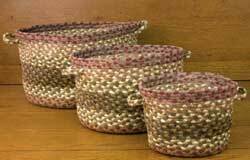 Sold individually from four sizes - Choose the Mini, Small, Medium, or Large. Mini measures 8 x 6 inches; Small measures 9 x 7 inches; Medium measures 12 x 9 inches; Large measures 17 x 11 inches. Has attached double handles. 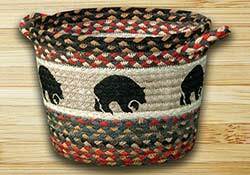 Use one of these baskets for laundry, storing toys, kindling for your fireplace, storing items in your car, blankets in your spare bedroom, towels in your bathroom, etc etc. 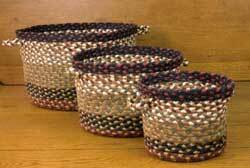 Olive, Burgundy, and Gray Braided Jute Basket Set, by Capitol Earth Rugs. Designed to fit Corning Ware French White Round Casserole dishes. The set of four sizes includes 1 of each of the 7 ounce, 16 ounce, 1.5 quart, and 2.5 quart. This is for the large size, and features a border of shamrocks, and braiding in greens, gold, and tan. 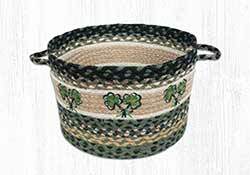 This is for the medium size, and features a border of shamrocks, and braiding in greens, gold, and tan. 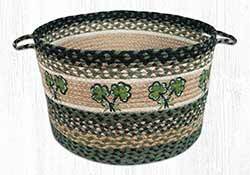 This is for the small size, and features a border of shamrocks, and braiding in greens, gold, and tan. 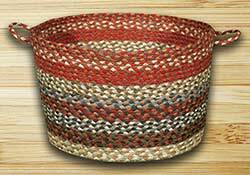 Trellis Jute Basket, by Tag. 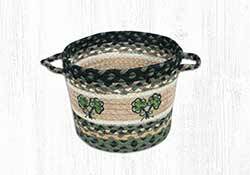 Natural fiber jute basket printed with a trellis design in either a fresh green or cool teal. Perfect for gardening, going to the beach, knitting, laundry, or more! Wipe clean with a damp cloth. 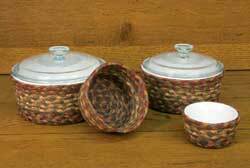 Sold individually - Choose the Smaller or Larger basket. Part of The Gardener Collection. Measurements: Small is 8.25 x 7 x 7 inches, Large is 9 x 15 x 8 inches.